Let me take you back to the first days of Screenland and I booking this film, or attempting to. We were having the hardest time locating who owned the screening rights to Black Christmas. After a couple weeks with no luck, I employed my friend Justin Beahm and asked for his help. It only took him half a day and not only did he find it, but he came up with a great plan. Justin is on the board of directors for the non-profit sCare Foundation and offered the idea to make this event a fundraiser. 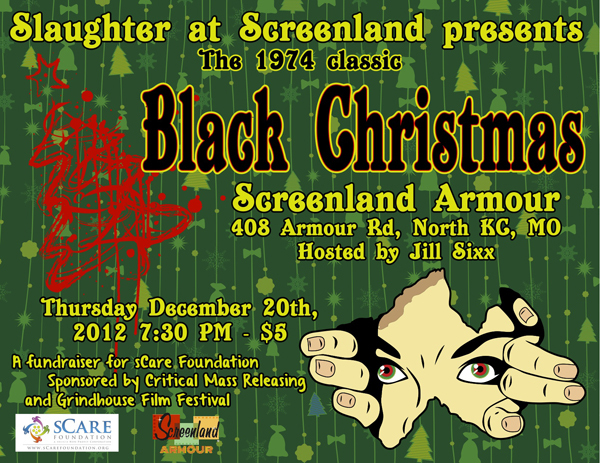 Critical Mass Releasing and Grindhouse Film Festival loved the idea and dontated Black Chrismas to us. Mr. Beahm had planned to attend the screening to represent sCare. If you are from here you know that the previous night we had a snow storm, but it was far worse north of us. The weather made it impossible for him to attend. sCare Foundation is a non-profit that supports at-risk youth and the Los Angeles Children's Hospital. In order to raise as much money as humanly possible with the crowd we had a raffle, along with the $5 donation for admission. We were overwhelmed by the amount of gifts donated to our prize packs. The packs included: year pass to Screenland Armour, Alamo Drafthouse gift cards and tickets, Vintage Stock gift cards, movie posters, DownRight Creepy gave us horror toys and DVDs, T-shirts, and more! We ended up raising $305! 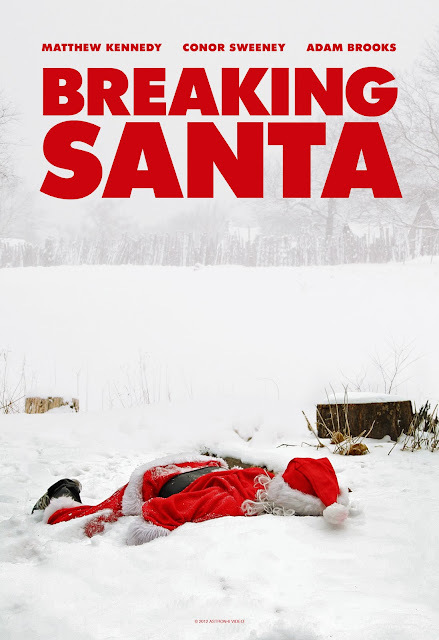 Then, only a few days before the event, Matthew Kennedy of Astron-6 offered us their brand new short to screen, Breaking Santa (click this link to WATCH the film NOW). Astron-6 is a group of filmmakers from Toronto and they are well known in the horror community for their the over-the-top, controversial film Father's Day (2012). Troma released that film and had a bit of a falling out with the filmmakers. Astron is planning on releasing a documentary exposing what all went down titled 'No Sleep No Surrender' and I plan to screen that here in KC, so watch out!